With 2019 right around the corner, it’s time to start thinking about your 2019 goals and how you’re going to make them happen. Because like it or not, we can’t just set goals and have them magically get accomplished (although how awesome would that be?!). Nope, you have to get strategic and make a plan. 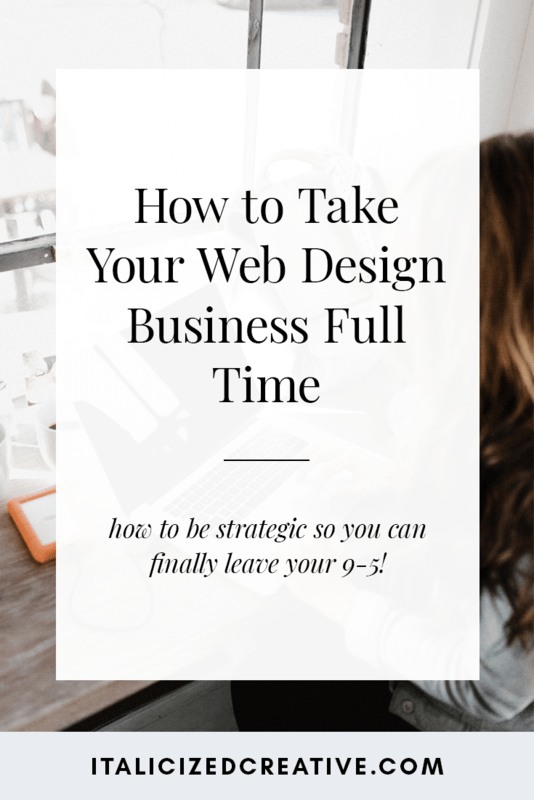 In the online business community, I know that one of the big goals a lot of people have is to quit their 9-5 and go full time with their design business. Maybe that’s your goal this year? If so, yay! As someone who has escaped cubicle life I can tell you it feels amazing. So if you’re ready to make 2019 the year you finally take your design business full time, keep reading to learn how you can make it happen. While I’d love to tell everyone to just quit their 9-5 right now, I know that’s not financially possible for a lot of people. Ugh, being an adult, am I right? So the first thing you need to do to get the ball rolling is crunch some numbers. Pull out that calculator, grab a pen and some paper, and make yourself a big cup of coffee (because math). The first thing to figure out is how much money you need each month to survive. We’re talking bills, groceries, and living expenses. If you already have a budget in place, use that. If not, hunt down those bills and start calculating. The goal here is determine how much money you spend each month in order to live a comfortable life. And when I say comfortable, I mean eating what you normally do, not ramen just because it’s cheaper. I also don’t mean going out to eat every night because you’re lazy. So while you want to keep your expenses low, don’t cut everything out just so you can get by on less each month. Doing that is just going to make you miserable and make you resent your business, which is not how you want to get started. Now that you have a number in mind, it’s time to figure out how much you need to save. Because let’s face it, businesses go out of business all the time. And while you may have great months, you might also have terrible months. Having a savings cushion will allow you to take some risks and just generally give you peace of mind. Some people recommend having 3 months of expenses saved, others recommend 6 months. There’s no right or wrong answer. Just keep in mind that the more you have saved, the longer you can go if your business isn’t exactly working out. Also, I would recommend having some extra money saved for those things that tend to pop up at the worst moments. You know, like car and house repairs and vet or medical bills. Remember that number you got for your monthly expenses? While you used it to determine how much money you need to save, it also has another purpose: how much you need to earn each month. So keep that number in mind as you’ll need it going forward. Now that you have an idea of how much you need to make and how much you need to have saved, it’s time to create a plan. Because if you go into business without a plan, you’re going to burn through your savings very quickly. Unless you’re some entrepreneurial genius (if so, lucky you!). The goal is to start making money as quickly as possible. Because the quicker you can see regular income coming in, the sooner you’ll be able to ditch your 9-5. Think about what it is you want to offer. How can you package it as a service that you can offer immediately? We’re looking for a minimum viable product here. So while yes, you eventually may want to launch this huge custom website package with all the bells and whistles, now is not the time for that. You want to get something up and running now. Think about how you can break up your ideal service offering into a smaller, yet valuable service. What needs to be done before you can officially launch it? Make a list of everything in one giant to do list. Once you have a basic idea for what you’re offering, now comes the fun part: pricing. Now I know you’re just starting out and you don’t feel like a professional yet, but that doesn’t mean you should charge super low fees. And yes, I know that you just want to get hired, but again, we’re not going to charge peanuts. Because here’s the thing. Charging ridiculously low prices is undervaluing yourself. And you deserve to make a decent income. Plus, when you charge next to nothing, you end up having to work more just to make ends meet. And when that happens, balls get dropped and you end up miserable. It’s so much easier to have 1 well-paying client than it is to have 2+ low-paying clients. Work smarter, not harder. So how do you determine a price? Take a look at other people in your industry. What are they charging? Use that as a starting point. Does it seem outrageous for someone just starting out? Does it seem like it’s worth your time? Here’s a tip: when determining a price, if it feels good, you’re not charging enough. The goal is to be slightly uncomfortable with the number. Usually that’s when you know you’re charging appropriately for your services. Remember that your time is valuable and you need to be paid accordingly! When you’ve figured out how much you’re going to charge, it’s time to figure out exactly how many you need to sell in order to reach your monthly living expenses. So divide your living expenses by the price of your service. This is how many you need to sell. Seem like too many? Double check your pricing or your monthly living expenses. Can you higher your pricing or eliminate anything from your expenses? The number you need to sell is your ultimate goal. If you can sell that many in a month, then you can survive on your business alone. But unless it’s a really low number, you’re probably not going to reach that right out of the gate. That’s where we’re going to break down your goal into smaller, more easily achievable goals. So let’s say you need to sell $5000 worth of services in a month to quit your 9-5. If your service is priced at $500, you need to sell 10 of them in a month. 10 is reasonable, but hitting that in your first month? It’s possible, but let’s be realistic. So instead of trying to hit 10 right off the bat, let’s instead aim for 3. The next month, let’s higher it and aim for 5-6. The following month, 8. And by month 4, the goal would be 10. Now keep in mind these numbers are being pulled from thin air. Depending on what you’re offering and how you’re marketing yourself, hitting your goal of 10 could be done in 2 months. The point is to break down your goal into smaller, attainable goals so you can use your success as momentum to propel you forward. Once your goal is broken down, you now have a general idea of when you can call it quits. Circle that day in your calendar. This is when you’ll finally be able to give in your 2-weeks notice. How does it feel to have a plan? I bet it feels pretty awesome! Financials figured out: check! Plan in place: check! Now it’s time to figure out exactly how you’re going to make this dream of yours happen. Think about the process of someone hiring you. First, they need to know you exist. Then they need to know what you offer so they can determine if they need to hire you. Lastly, they need to reach out and inquire about your services. Sounds like a pretty easy path. But let’s break down each step so you can make it happen. Since the first thing they need to do is know you exist, it’s time to figure out how you’re going to get your name out there. There are a ton of ways to do this and you’ll probably want to try a bunch to see what works. Some ways include posting to social media, being active in Facebook groups, making connections with other business owners, publishing blog posts, doing live video, and more. Keep in mind that it takes something like 7 points of contact before someone will buy from you. So the more visible you are, the better. Now obviously the list above is huge and your time is probably limited. Don’t do it all. It’s not worth it. Pick a few and give it a try. If something’s not working, either adjust or drop it. It’s not worth doing something if it’s not providing value. Your name is out there, next up is showing people your value. The above tasks should be helping you with this. Or at the very least, give people a sense of what you do. So let’s say they’ve come in contact with you and like what they see. They’re now thinking they need you in their life. What will they do next? If you said head over to your website, then you’d be correct. The goal is to get them over to your work with me page where they can learn specifically how you can help them. That means you need to have an enticing sales pages up and running. This page should include everything someone needs to know in order to decide if working with you is for them. We’re talking what value the service provides, who the service is (and isn’t) for, pricing, what to expect, a schedule, FAQs, and booking process. This leads me to the final step, getting them to click the book now button. First of all, make sure there are several of these scattered throughout the sales page. Make it easy for them to find and make it easy for them to complete the booking process. And once they’ve booked, have a plan in place as for how you’re going to handle it. Are you going to have an autoresponder set up with next steps? Are you going to email them particular instructions? Don’t leave this to the last minute. You want to come across as the professional that you are, so that means you need a plan! When it’s outlined in the above 3 steps, getting clients sounds easy, right? And yes, it can be that easy. But the hard work will really come in step 1: visibility. Remember to get your name out there, but more importantly, remember that you need to provide value. Designers are a dime a dozen. Show people how you are the answer to their problems and you’ll be on your way! So far, so good? If you’re feeling overwhelmed, you’re not alone. There is a lot that goes into running a successful business. Add in a 9-5, running a household, and having a life and you’ll notice just how fast 24 hours can fly by. One of the biggest ways you can fail as a business owner is to burn yourself out. So before that even happens, it’s time to make some changes. Turning your dreams into a reality is going to take lots of hard work and sacrifice. But you can do it. And the end result is so worth it! Take a look at everything you have on your plate. What can you drop? What can you delegate? Because now as a business owner, time is money. You only have a finite number of hours in a day. You need to make sure each of those hours is spent in the best way possible. Let’s start with your business strategy. Do you need to be on every social network? Do you need to write several blog posts a week? Remember to work smarter, not harder. Is there anything that can be eliminated? Now what about your home. Rather than spending hours cooking dinner, do you have room in your budget for a meal prep service? Or maybe it’s worth the extra money for you to have your groceries delivered or to have someone come and clean your house. And if your budget is tight enough as it is, how can you simplify these things? For example, I’m a fan of shopping at Aldi because I can get in and out in less than 20 minutes. Sure, ShopRite or Wegmans has more variety, but the time saved is worth the small sacrifice. And in terms of cleaning your house, can you skip some corners to save some time? I’m not saying to leave your house a mess, but can you vacuum every other day instead of every day? For your 9-5, can you talk to your boss and see if you can work some days from home? It might not seem like much, but not having to commute twice a day and having to do less to get ready in the morning can make a big difference. Also, when thinking of things to drop or delegate, think about unnecessary expenses as well. Do you need that daily Starbucks run or can you make coffee for yourself in the morning? Saving money where you can means you can save more quickly, which means saying adios to your 9-5 even sooner. Now I’m not telling you to let your whole life go to shambles just because you’re starting a business, but these are things to think about. We want to prevent burn out so that’s going to mean making sacrifices. Remember work smarter, not harder. You can plan all you want, but you won’t make your dreams a reality unless you do the work. It’s going to be hard and it’s going to take some sacrifice, but in the end, you’ll be a full time business owner who is free from the cubicle life. As you work towards your goal, one thing to do every so often is to analyze how things are working. Perhaps you’ve been putting in a ton of time on Twitter, but you’re not seeing results from it. Time to reanalyze and change things up. Or maybe you didn’t hit your goal at the end of the first month. What needs to be done to ensure you hit your second goal? Or maybe your goals were a bit too lofty and they need to be adjusted so that you can hit them? Remember that doing the same thing over and over again and expecting different results is called insanity. Give things some time to see if they’re working, but don’t be afraid to pull the plug if something doesn’t end up working. Also, keep in mind that what worked for someone else might not necessarily work for you. Each business is unique, so do things on your own terms. Do the above and you should be on your way to escaping your 9-5 and going full time with your design business. When you’ve reached your big goal (hopefully before that date you circled in your calendar), it’s time to hand in your two-weeks notice. Then it’s time to celebrate because you just make significant progress in making your dreams a reality.